I haven't been taking very many photographs on rainy days. The positive side of all the rainy weather is that plants and flowers have stayed happy in spite of the heat. I would prefer that the rain not come down quite as hard as it does on some days but too much rain in the summer is better than too little. They turned out great! I feel sorry for the little birdies! I like the rainy shots. The top is my favorite; I really get a feeling of downpour. Oh that comment about downpour was from Leora. 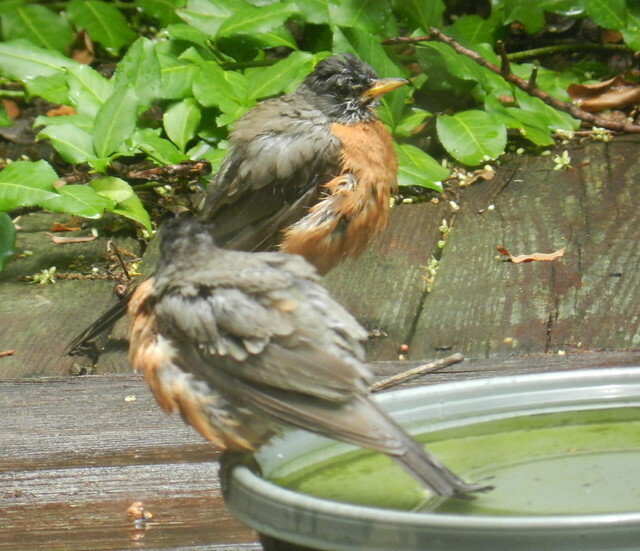 Robins are so darn cute when they're wet. 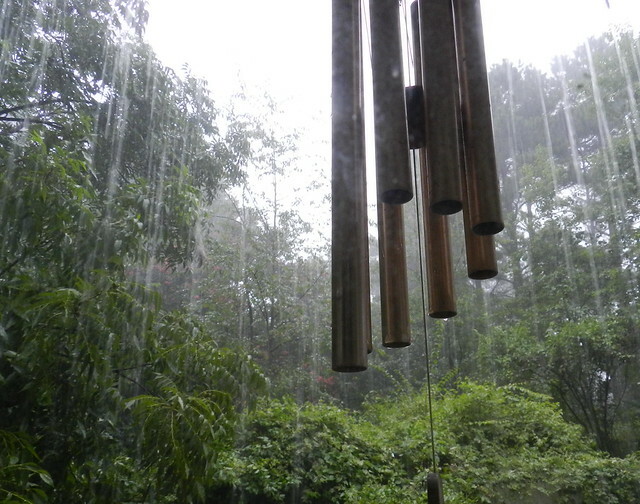 And the shot with the wind-chime and the rain is perfect, really shows what it is like at your house on a rainy day! (I have tried to get that feeling in a ipicture when we're in Oregon, but have never succeeded as well! We have an unexpected internet connection where we're staying overnight in Deadhorse (the end of the world!) ... I decided to visit some of my favorite people instea of tryig to put a post together ... will catch up eventually :>). Appreciate your ocmments and visits even though I haven't been able much to visit back lately. What a fantastic job you did capturing the rain! Its fluidity is always a challenge for photographs yet you managed to convey this falling wall of water so thirst-quenchingly well. Wonderful shots on a rainy day. 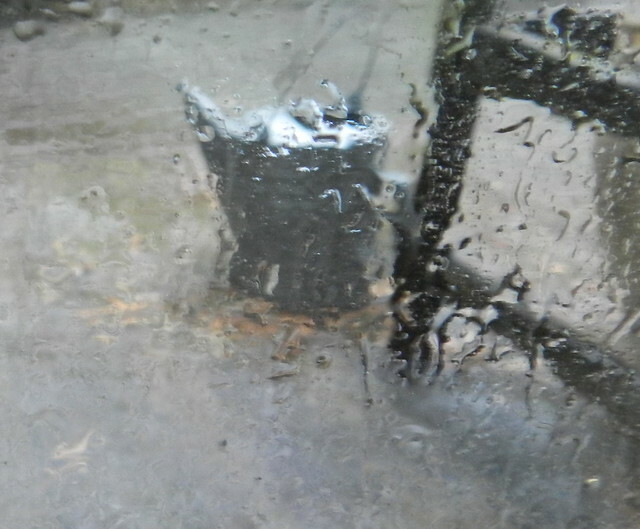 Quite a downpour but as you say the plants will be happy. I think your rainy shots all turned out well! you got a good soaking, something that california desperately needs. The plants do need the rain, but gee it was pouring down! Love the cute robins. Enjoy your new week! Rainy shots are wonderful - so long as you can stay dry while taking them! II'm with you there. 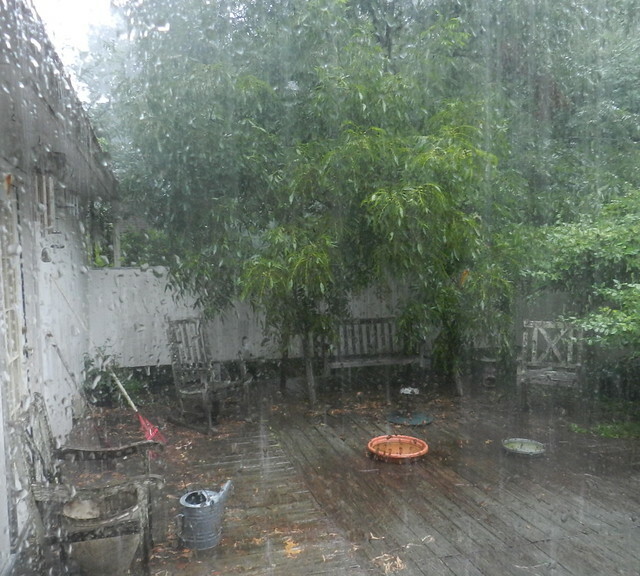 I'll take too much rain in any season here over too little any time. Love those plumped up robins. We had the same rainy days, two in a row this week. Today the sun is shining and I can't wait to go outdoors for a lovely walk and some much needed weeding. I never see the rain in action with such a beautiful composure..lovely captures..have a nice day. As a pluviophile, I absolutely love your rain shots! My you are having lots of rain. neat images of it too. Great rain shot - can't believe I missed the Our World Tuesday posting - just closed when I went to enter.